I'm almost 1/3 of the way around the Jan Stawasz Masterpiece! With any luck, I'll make it to the halfway mark by the end of the weekend. I'm sorry for the bad pictures. Night has fallen, and unless I clear off the dining room table, which is set up for blinging shuttles, there's no good place to take a picture right now. 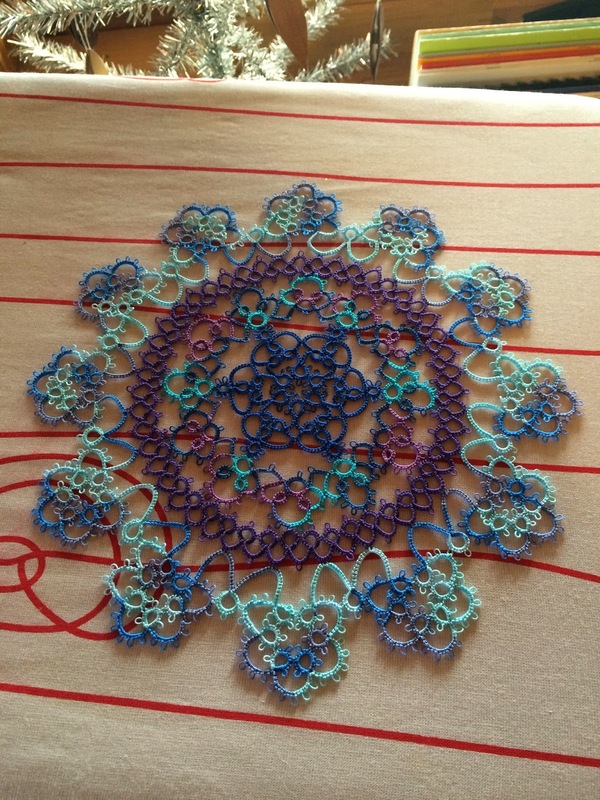 As I thought I would, I finished the last two flowers on Renulek's Spring Doily early this morning. I'm eager to start the next round! 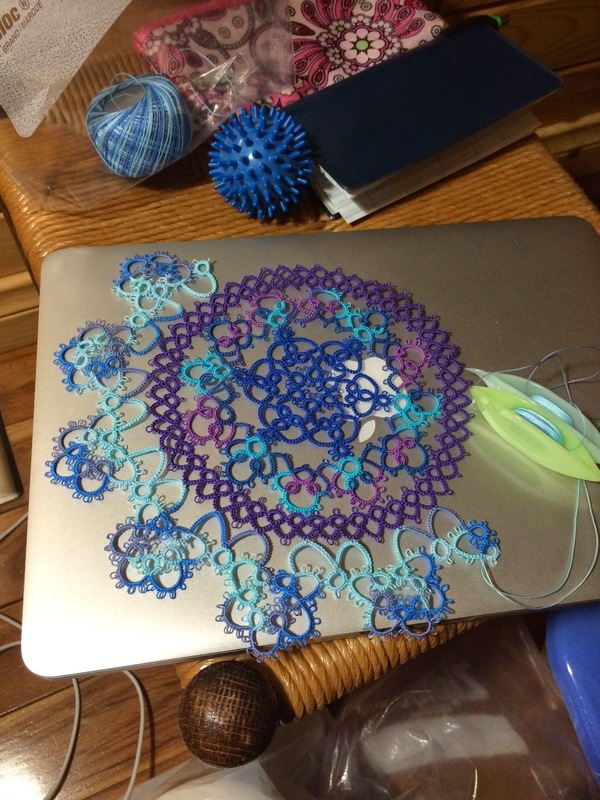 I also managed to work a little on my friend's throw. It is soft and thick, but I really do think this is the only one I'll ever make... unless I find that I just have to have one for myself! 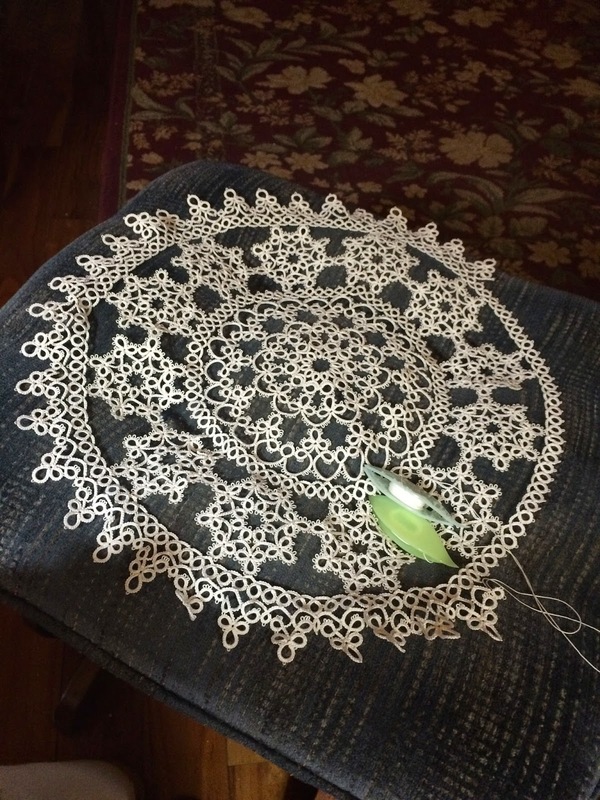 I found a little more time to tat today, and as a result I only have two flowers left to tat on Renulek's Spring Doily. 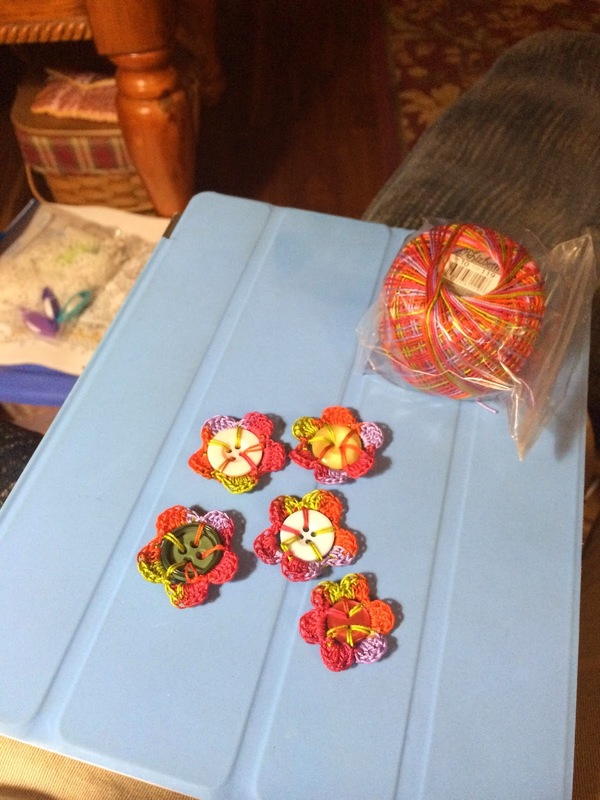 I think I'll finish them up in the morning and then move on to the next round. I also managed three more pattern repeats on the Jan Stawasz Masterpiece. I love the way this round looks! Do you remember Paige? 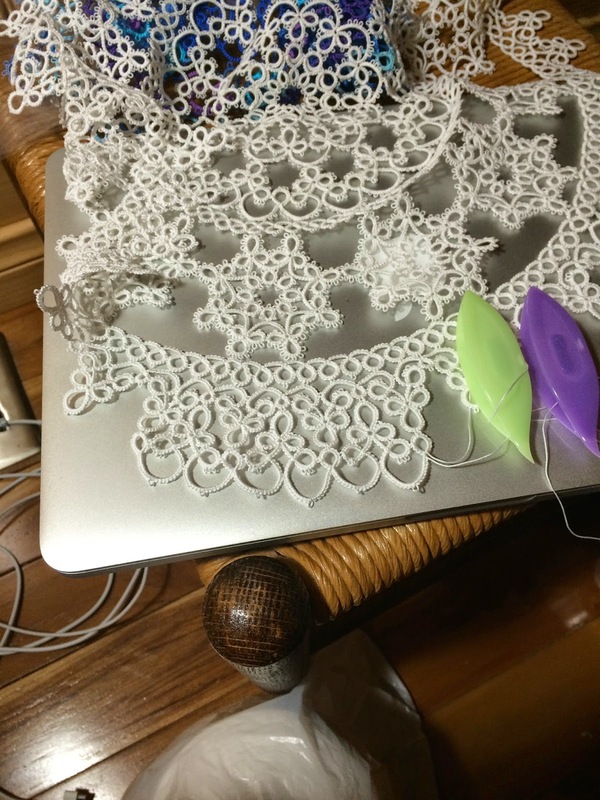 She's picked up her tatting shuttles again, and this time she's started a motif... without a pattern! Isn't she doing great? 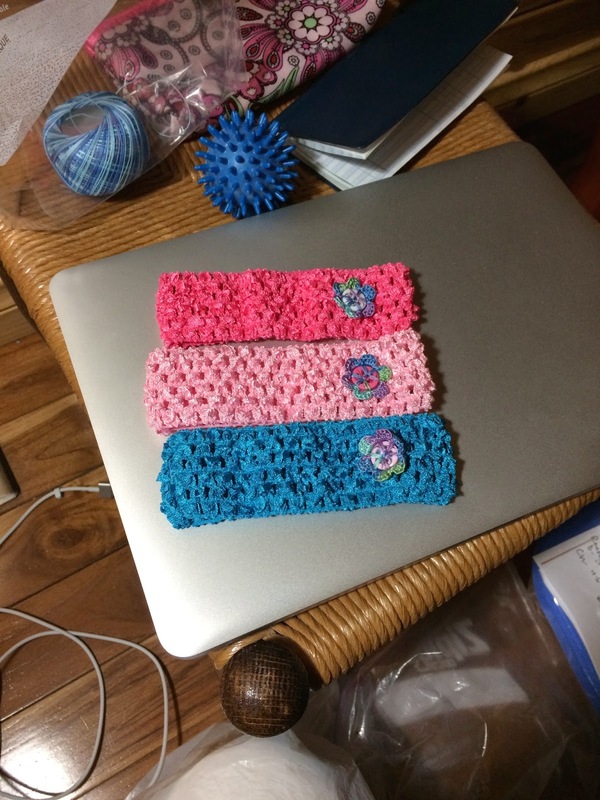 I love the colors of these headbands! 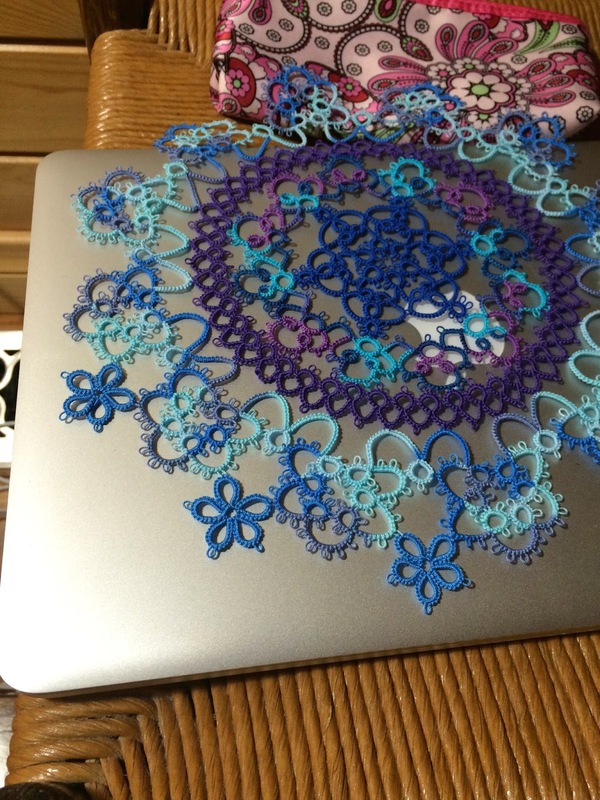 and I tatted one more flower on Renulek's Spring Doily at lunch time. I wonder what I'll feel like doing tomorrow? 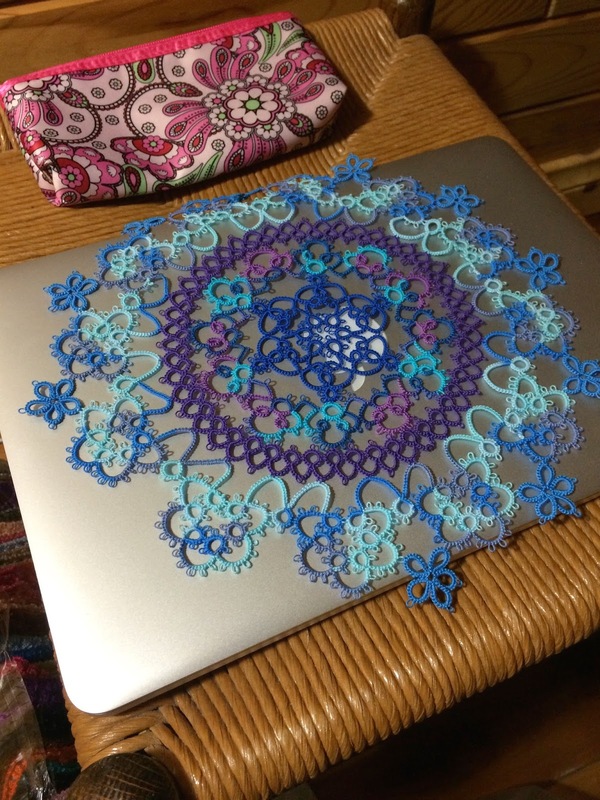 I took my tatting to school again today, and at lunch time I managed to tat a few more flowers on Renulek's Spring Doily. I'm halfway done with this round! I didn't have as much luck working on the Jan Stawasz Masterpiece. 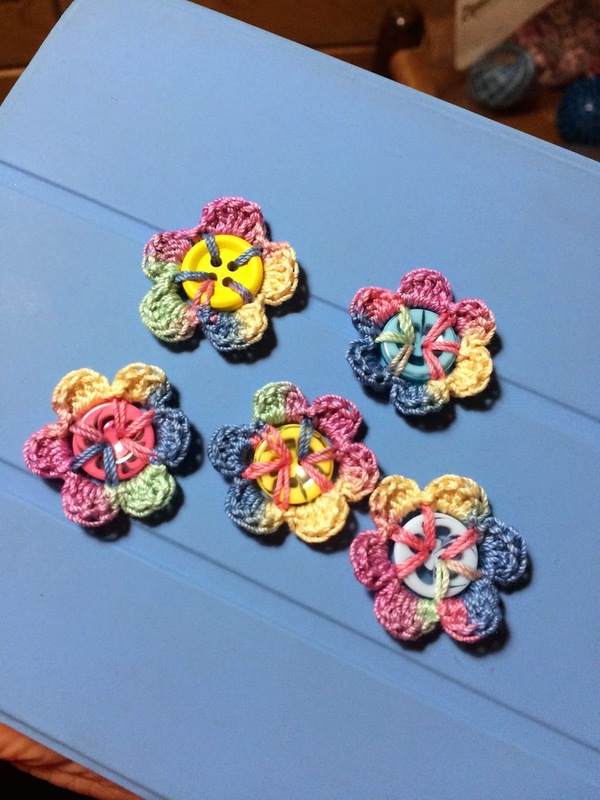 I only managed one pattern repeat, because I kept making mistakes and having to fix them. 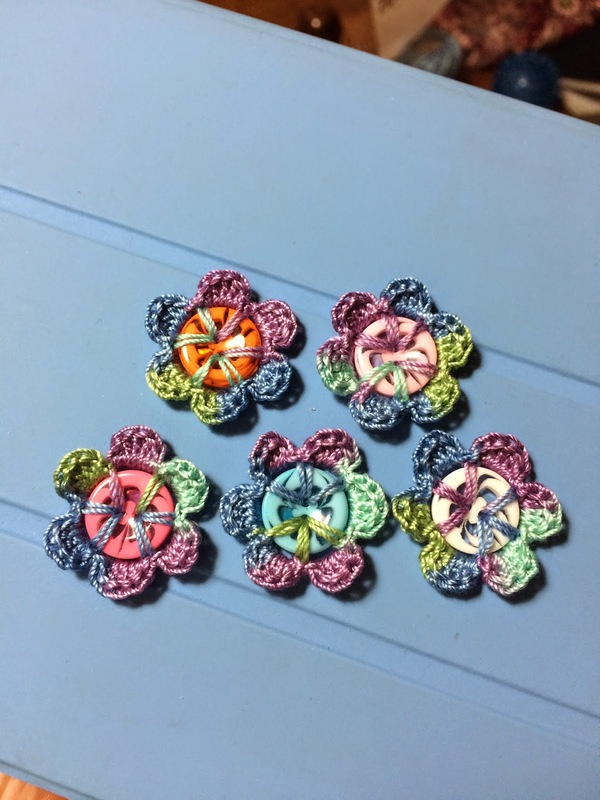 With all the time I put in, I should have finished three pattern repeats. Oh, well! Maybe I'll get more done tomorrow. 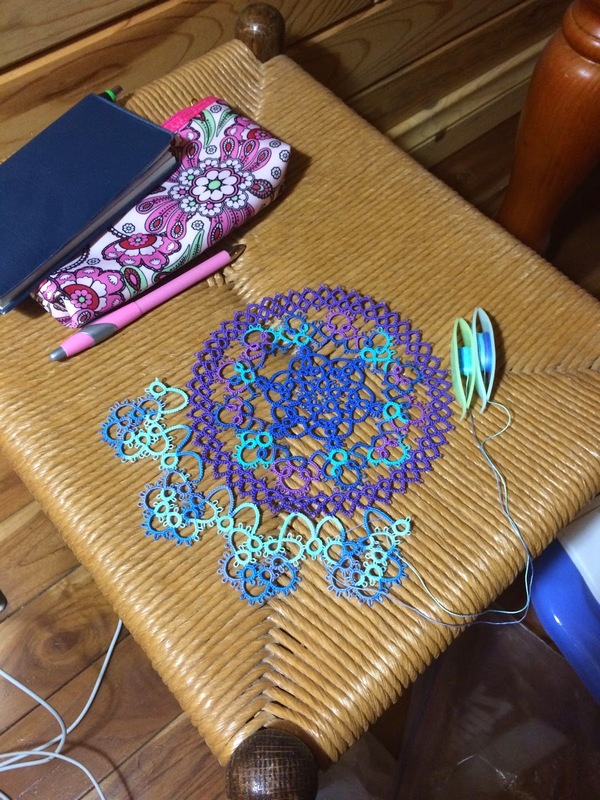 I spent an hour working on the throw for my friend. I'm afraid an hour a day will be my limit with this. I find working with such large needles to be very hard on my hands. 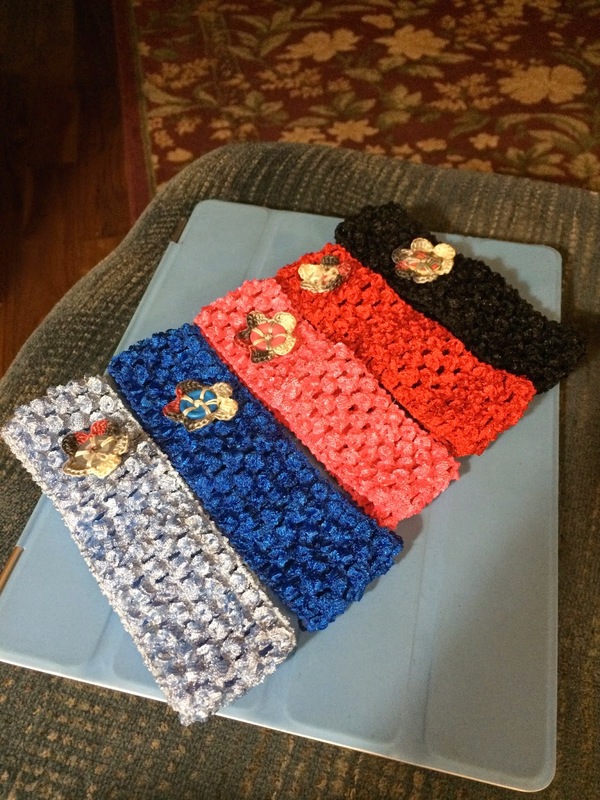 My new set of headbands arrived today. 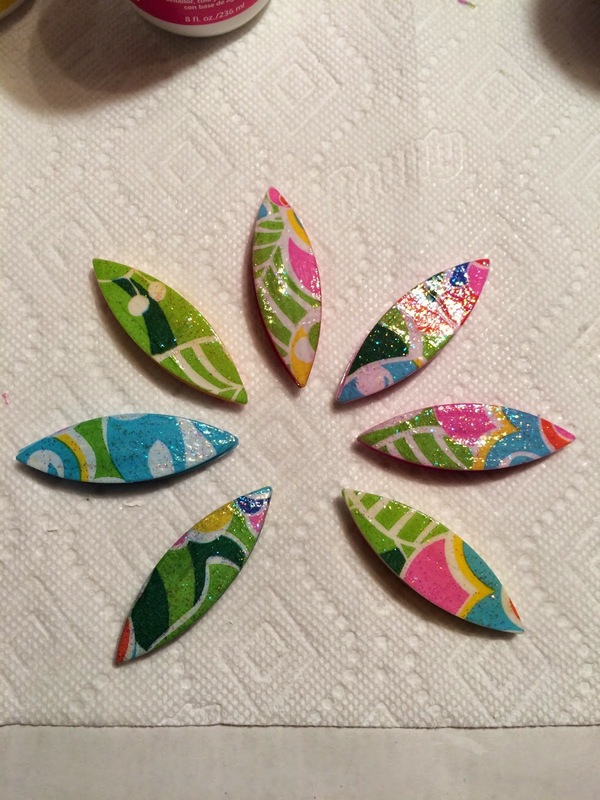 I can finish one in about 15 minutes, so they're great for instant gratification! What did you work on today? I guess I'd better start blog hopping and find out! 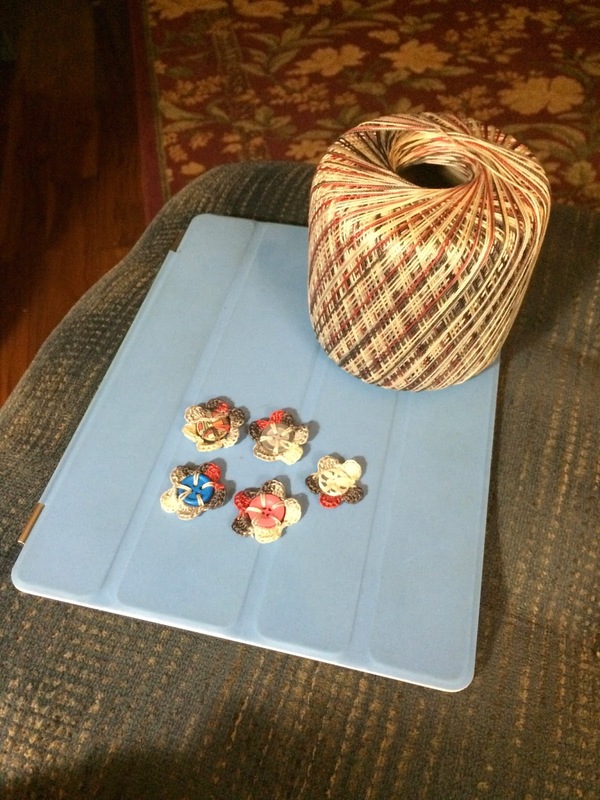 This post is dedicated to my third graders, especially those who read my blog! I love working with all of you, and I am thrilled that you enjoy reading what I write! 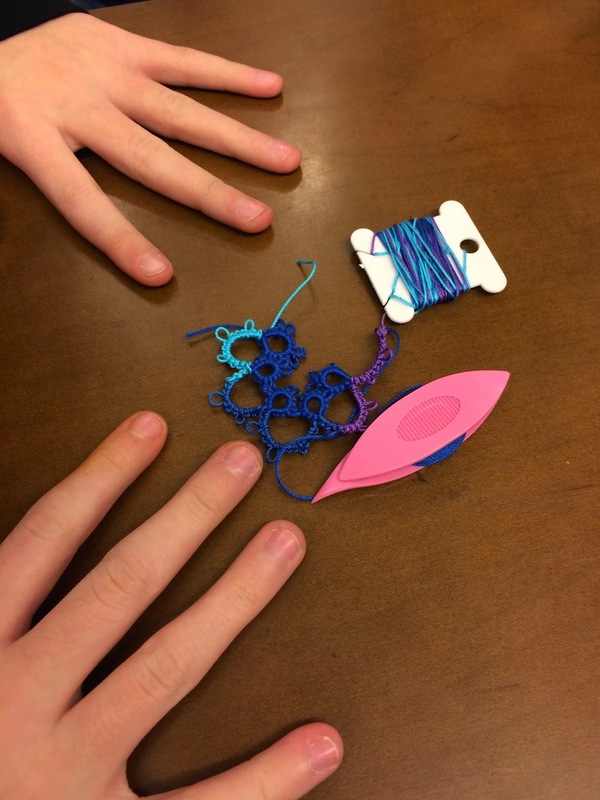 I took Renulek's Spring Doily to school today and showed some of the kids how to tat the flowers and join them to the doily. 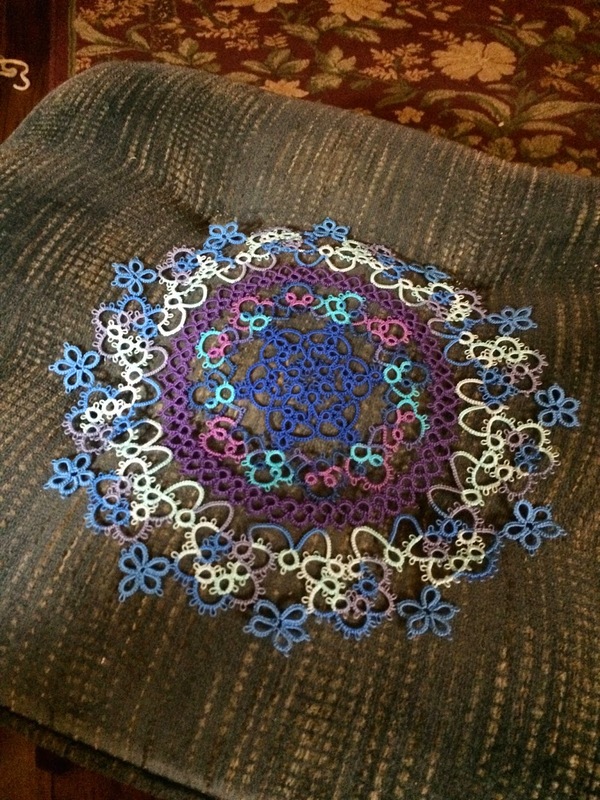 Several of them commented on how much they like the colors in this doily. I like them, too! I managed a few more pattern repeats on Jan Stawasz's Masterpiece while catching up on Downton Abbey before school. 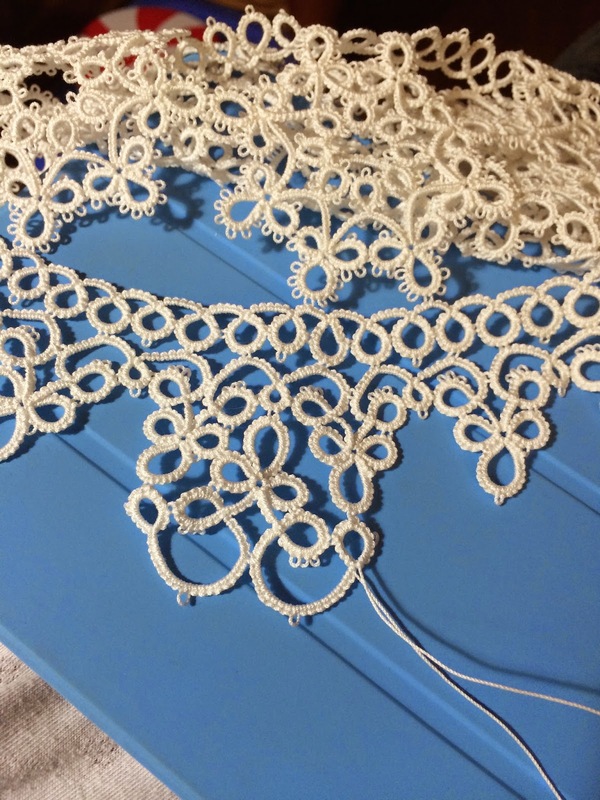 I really like the way this looks... lacy and substantial at the same time. 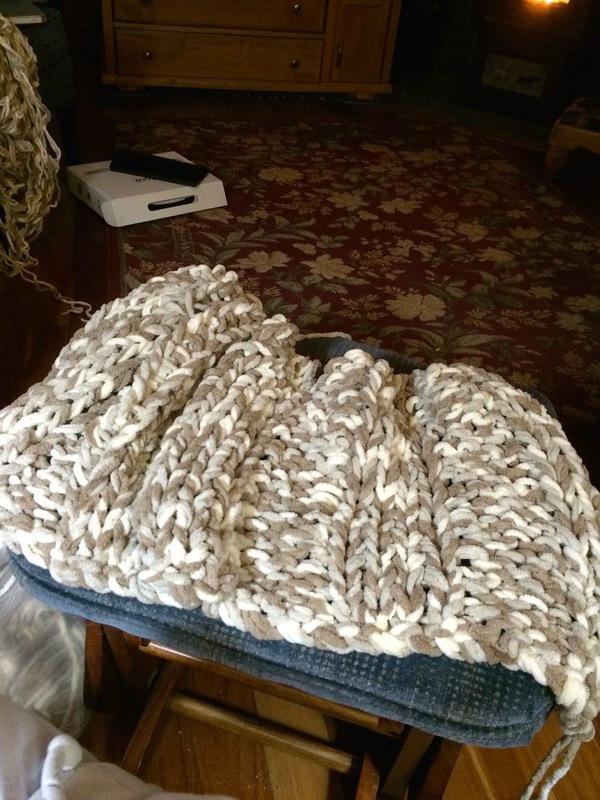 A friend asked if I could knit a super bulky throw for her. This is about 2 hours worth of work. 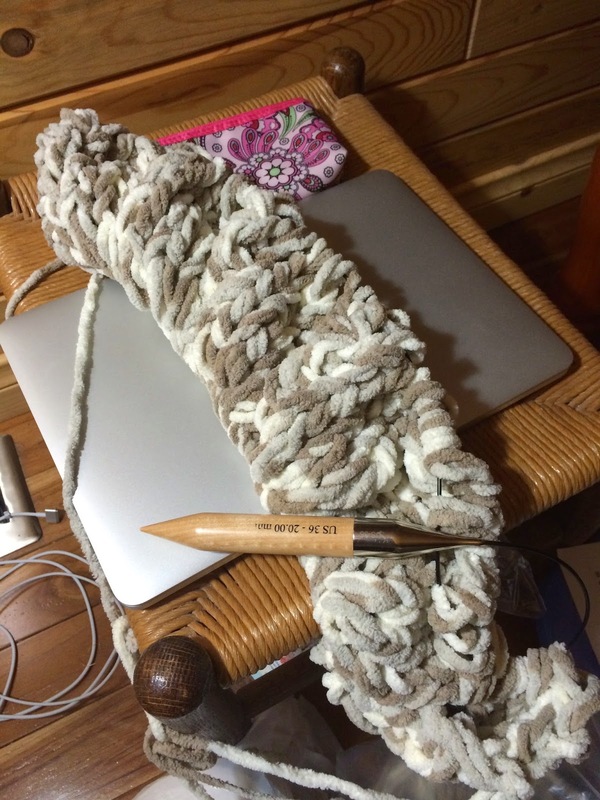 I find it very difficult to work with size 36 needles and two strands of super bulky held together. I'm pretty sure this will be a one time deal. 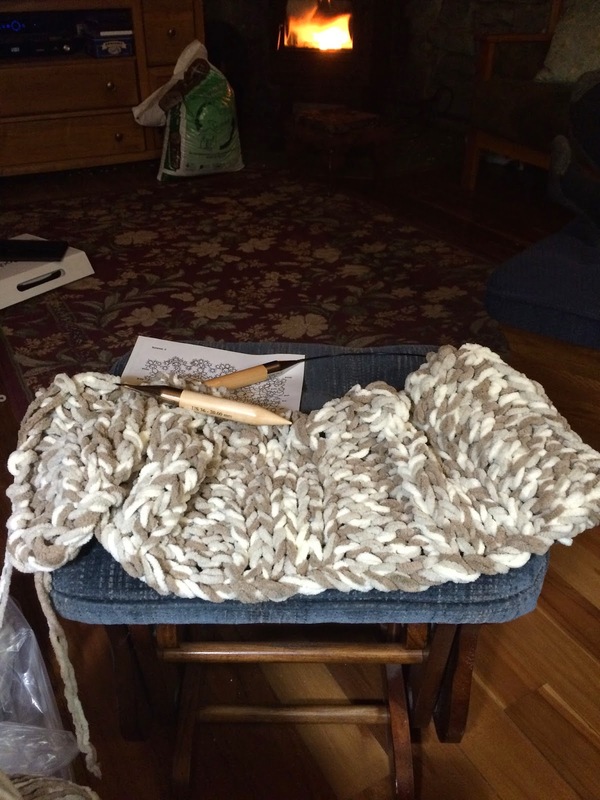 The yarn is super soft (Bernat Baby Blanket). I think it will be very nice when it's finished, just not my cup of tea! Last week I took my napkin collection in to school and let the kids who wanted to try blinging their shuttles choose some. Today, one of my third grade girls, Alejandra, showed off her initial efforts. Didn't she do a great job? We had meetings after school today, and then I had to pick Dave up from work, so I didn't have a whole lot of time to tat. Still, I managed to get in a couple of pattern repeats in, and that makes me happy! 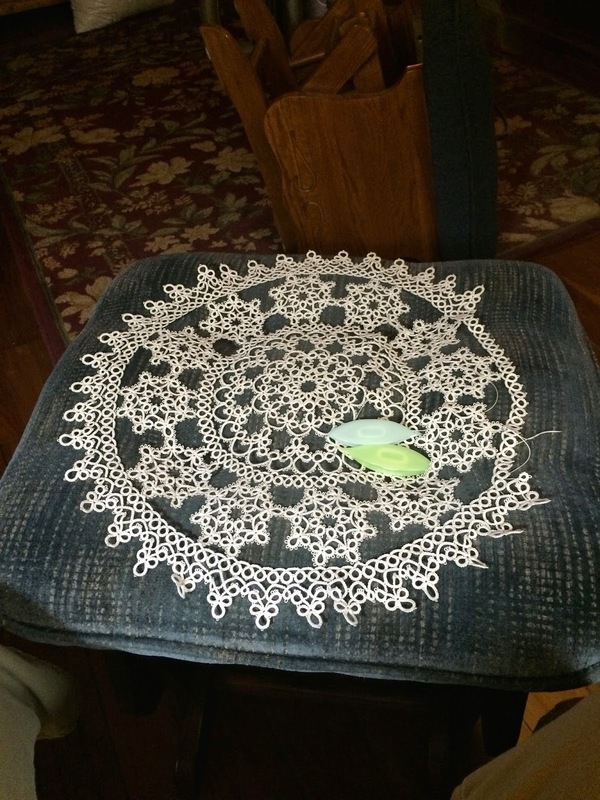 I finished round 4 of Renulek's Spring Doily. I was surprised at how long it took me to complete this round. I thought I could finish it this morning, but it took me most of the day. I don't think I'll take the picture on my ironing board again. The color looks terrible! 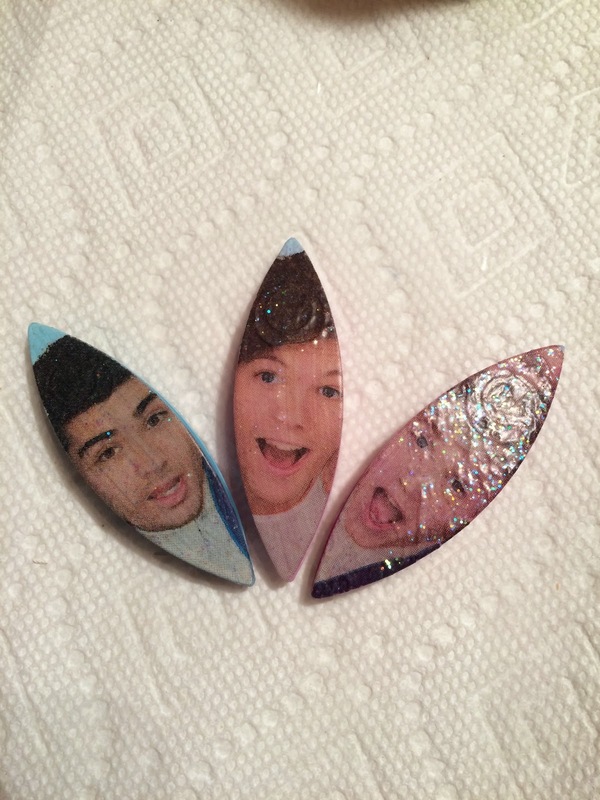 I blinged some more shuttles today. One of the teachers in our building brought snacks last month, and I took one of her pretty decorative napkins so that I could do a little decorating. One small napkin was enough to cover both sides of seven shuttles... pretty good! 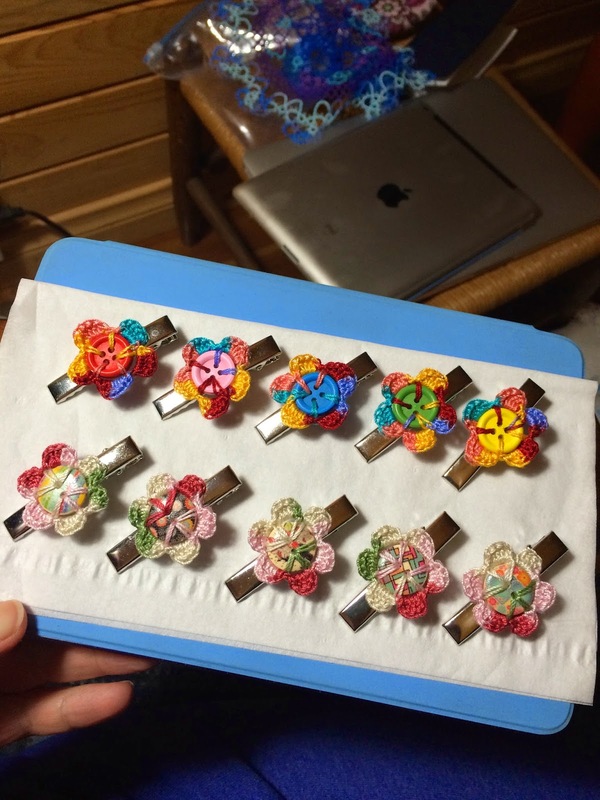 I finished some more alligator clips today. These are so cute! 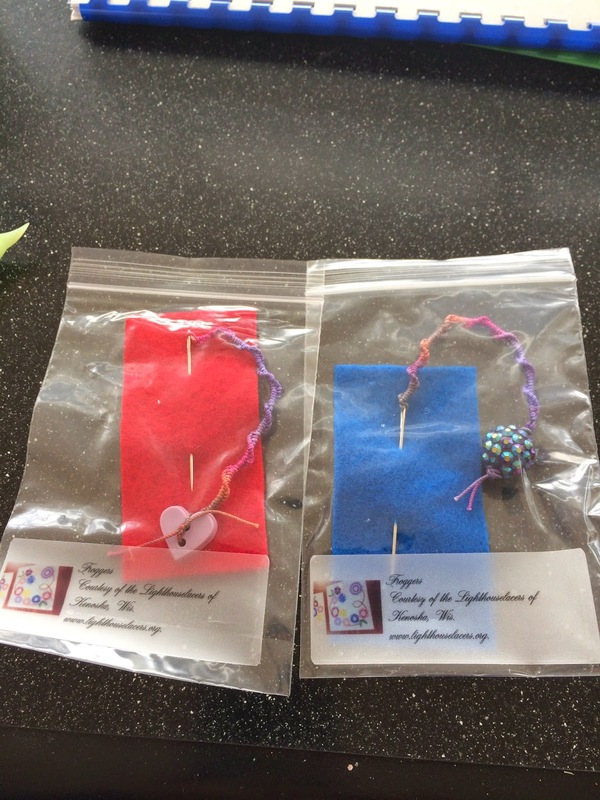 Now I just need to find some little girls who would like to wear them in their hair! 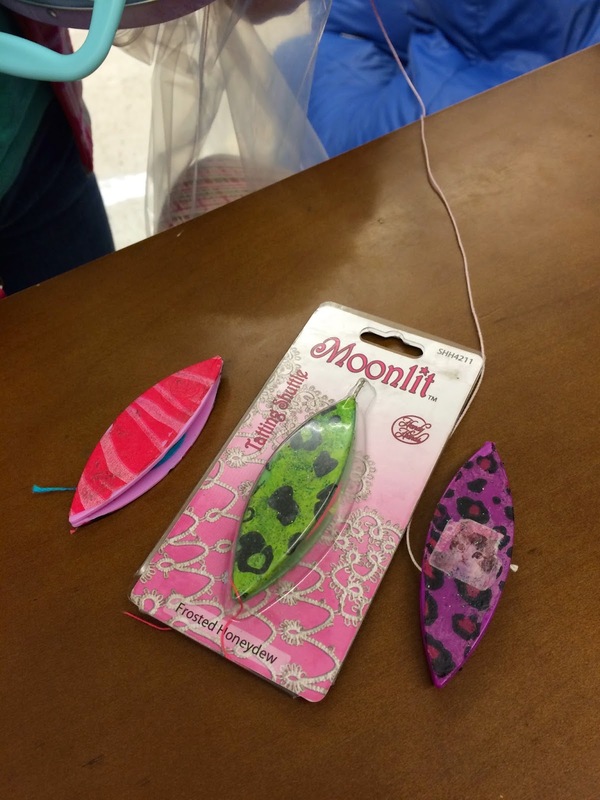 One of my second grade students came to me on Friday and asked me if I could decorate her tatting shuttles using a napkin from her birthday party. How could I refuse? 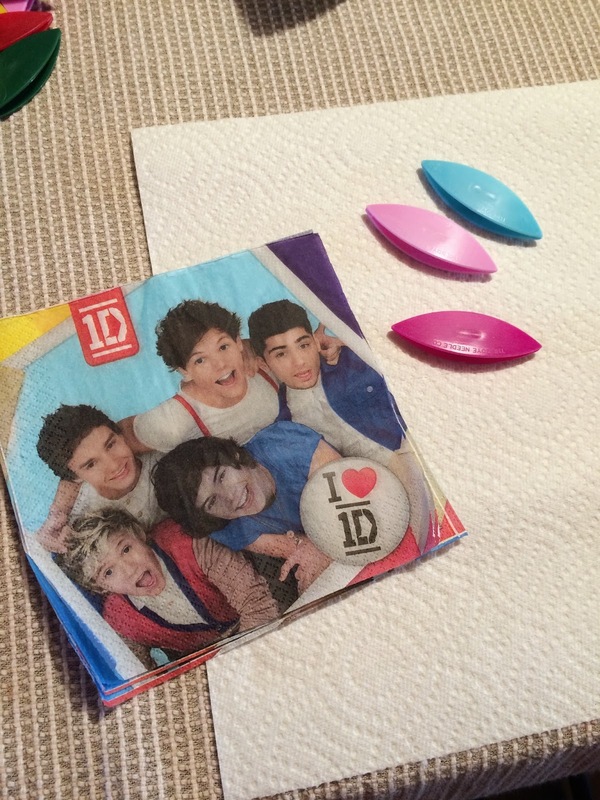 Luckily, the pictures on the napkin were strategically placed for tatting shuttles. 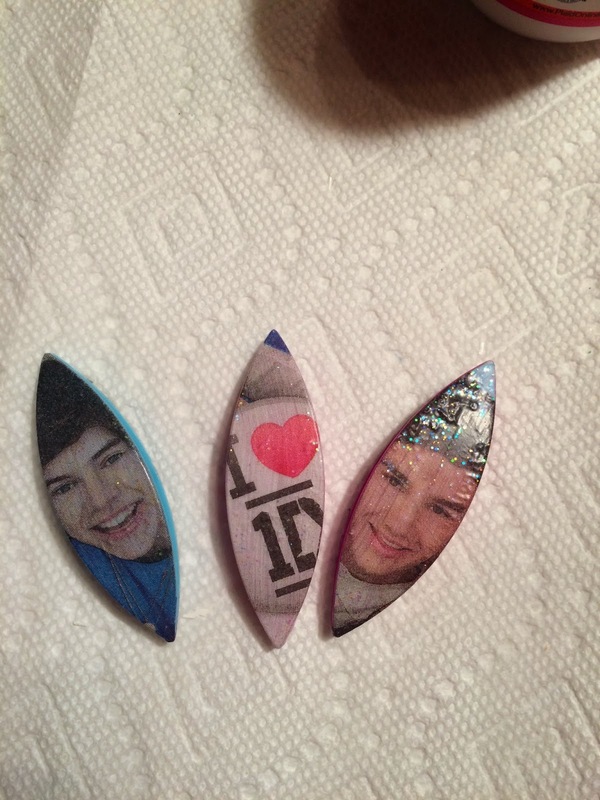 Jaden had three shuttles, and there are five band members... one face for each side and the I ❤ 1D. She knew the whole head would not be showing, but she trusted me to do the best I could. I think they turned out great. I hope Jaden likes them! 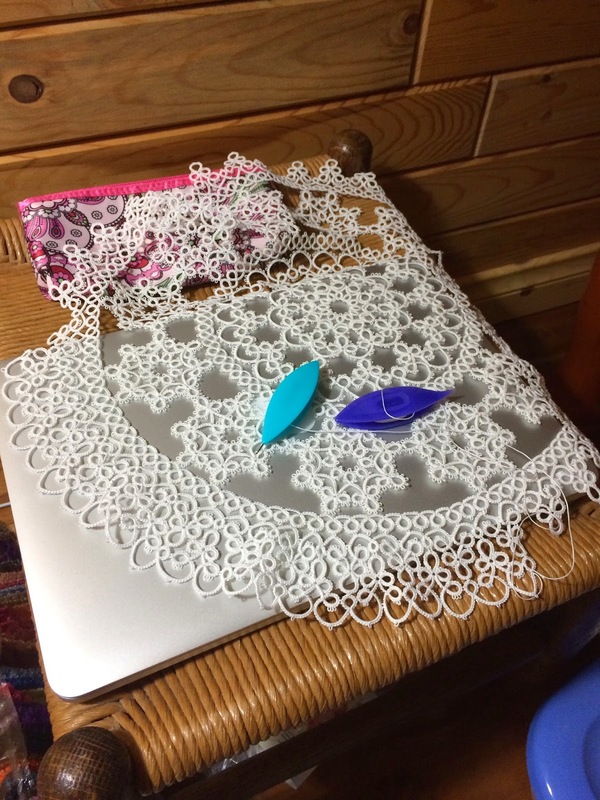 I tend to spend all day when I decorate tatting shuttles, probably because I get distracted with my tatting and forget to get back to the decoupaging. 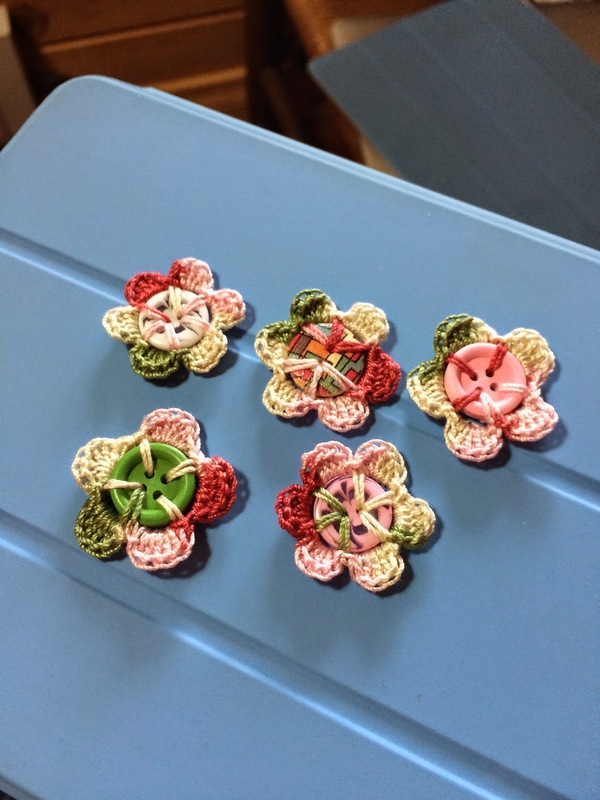 Since I've had some special requests for my crocheted button flowers, I decided to work on one button between each layer of Mod Podge. 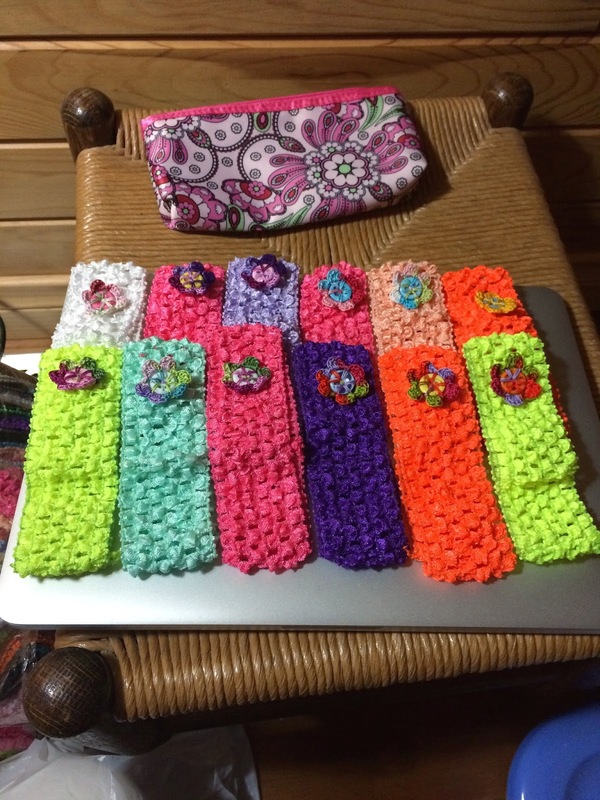 I finished quite a few, and I sewed some on to some more headbands. Even though I didn't get any tatting done, I did have a very productive day! 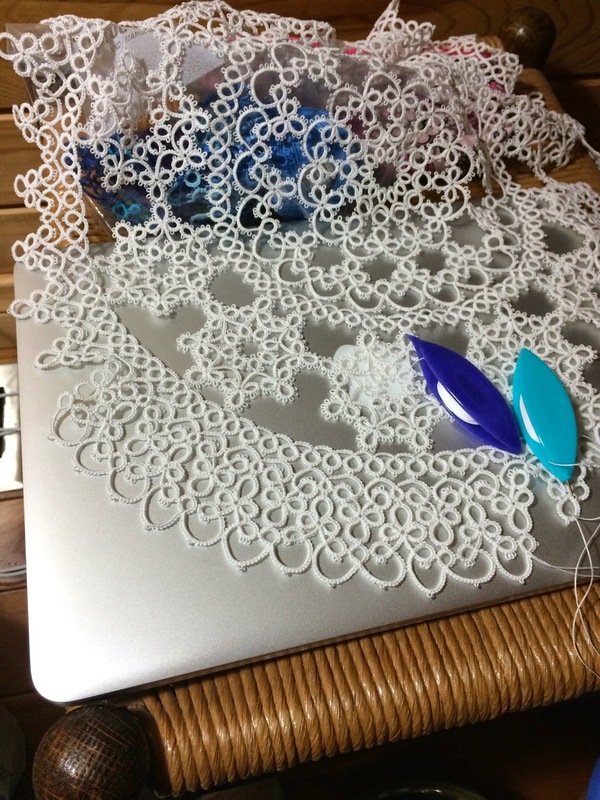 I'm very happy that I managed to tat the first pattern repeat with no mistakes! Let's see if I can continue this all the way around. Progress on Renulek's tat-along is slow but steady. I hope to finish this round tomorrow, because the next round is already available. 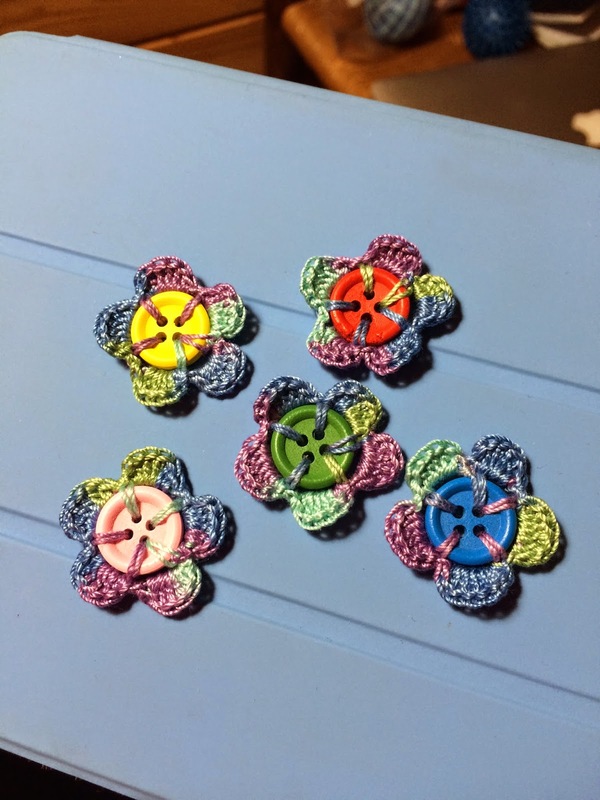 The button flowers continue to intrigue me. I wish I could get a good picture of the colors. They're so much prettier in person. I'm going to have to see if I can find some more stretch headbands. I took them to school with me today and sold 20 of the 24. 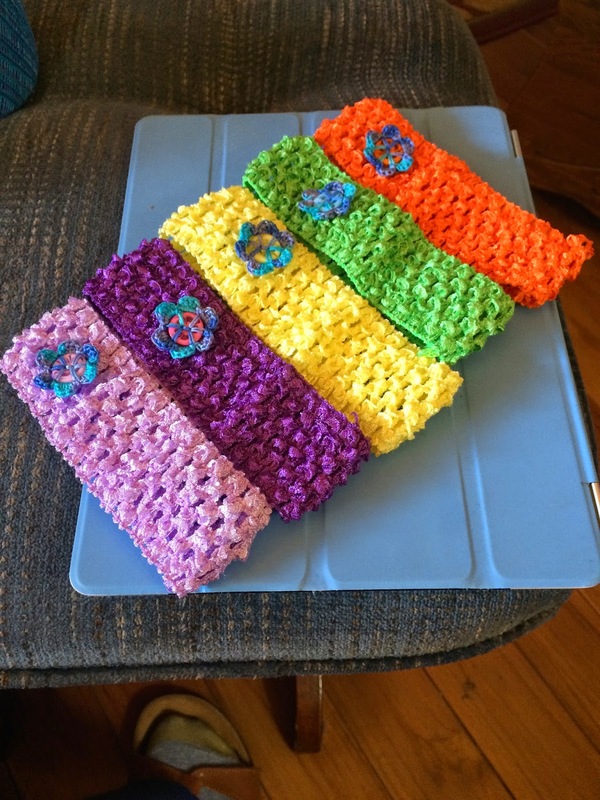 Maybe I'll have a second career selling hand-crafted items! I finally finished round 7 correctly! I'm very excited! 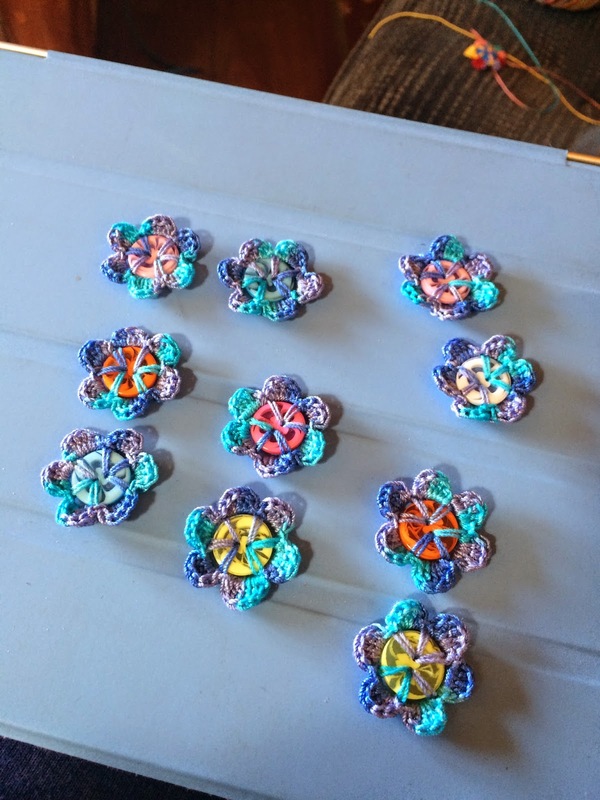 I also spent time playing with buttons. 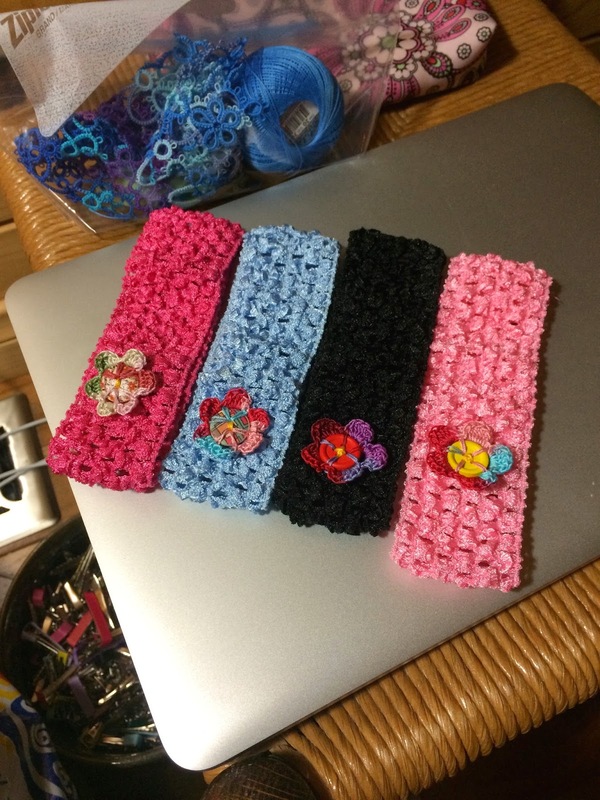 And now I have some cute headbands to share with little girls. I hope we'll be back in school tomorrow, but I sure did have fun today! I let myself get involved in too many projects today. 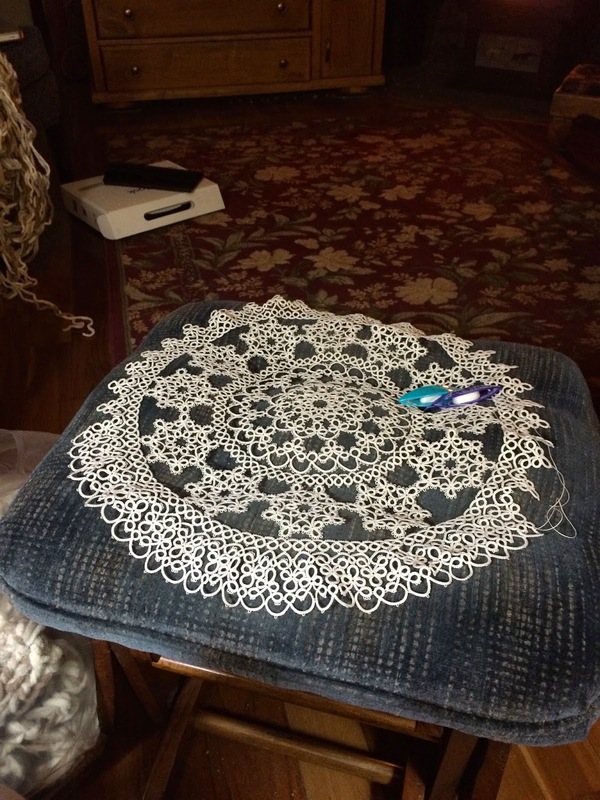 As a result, I only managed to tat one pattern repeat on the Jan Stawasz Masterpiece. I really need to take my pictures when there is still some light. I can't seem to avoid shadows! 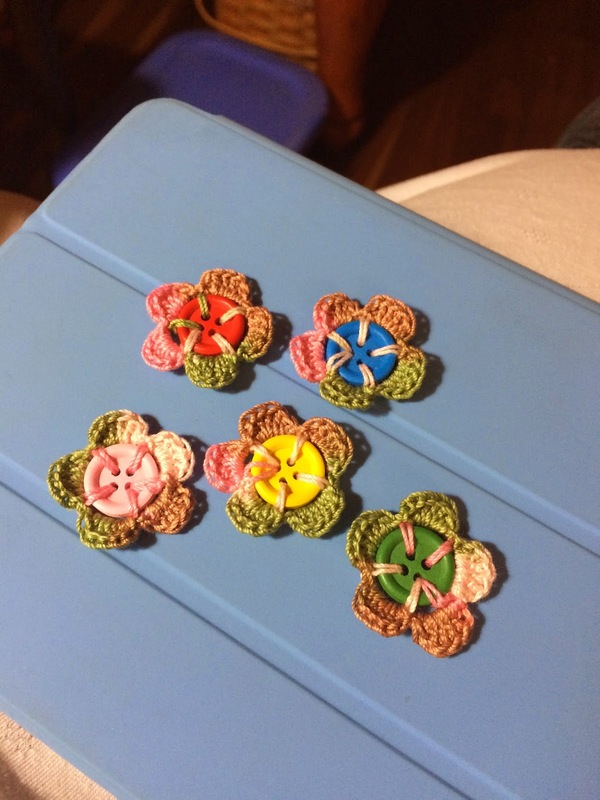 I was up pretty early today, so I finished up some more crocheted button flowers. 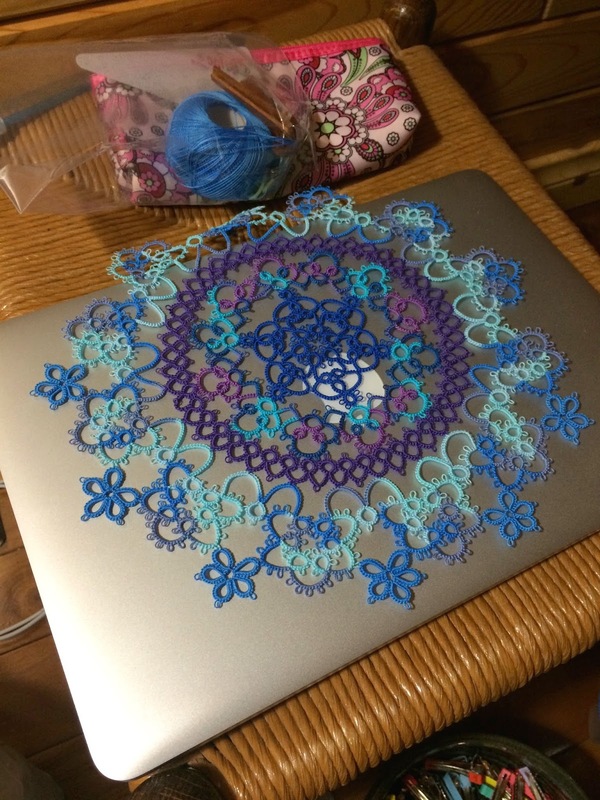 I also worked on Renulek's tat-along doily. 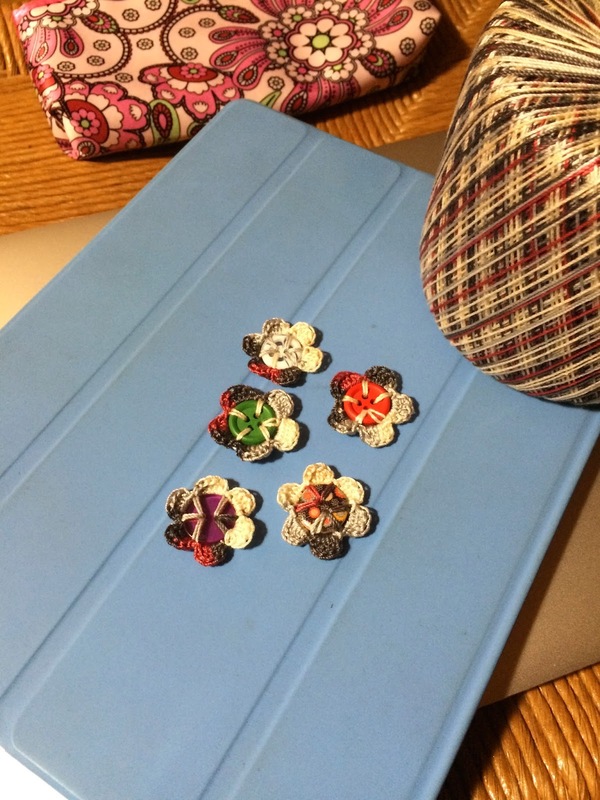 I was on the phone for quite a while after school, so I crocheted some more button flowers! 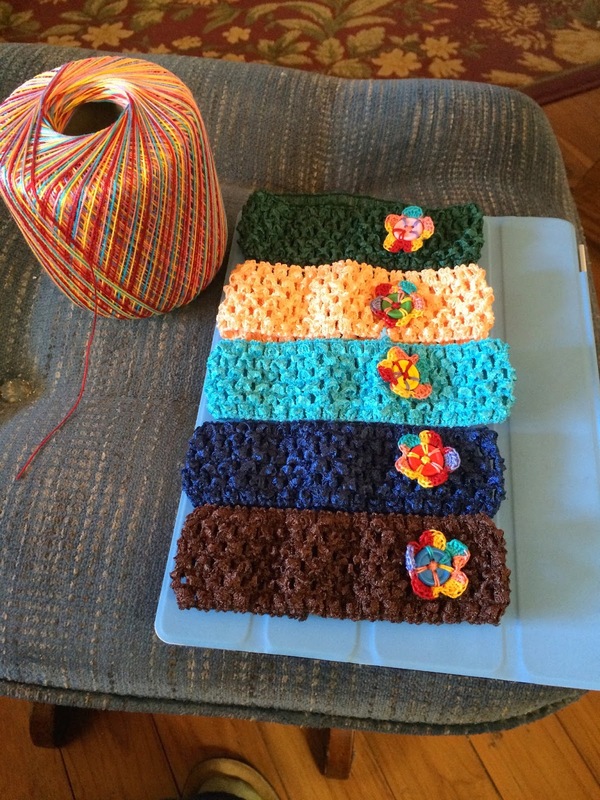 My stretchy headbands arrived in the mail today, so my afternoon buttons are now sewn on to the headbands. I'll be taking them to school tomorrow. I want to see how they look on kids! 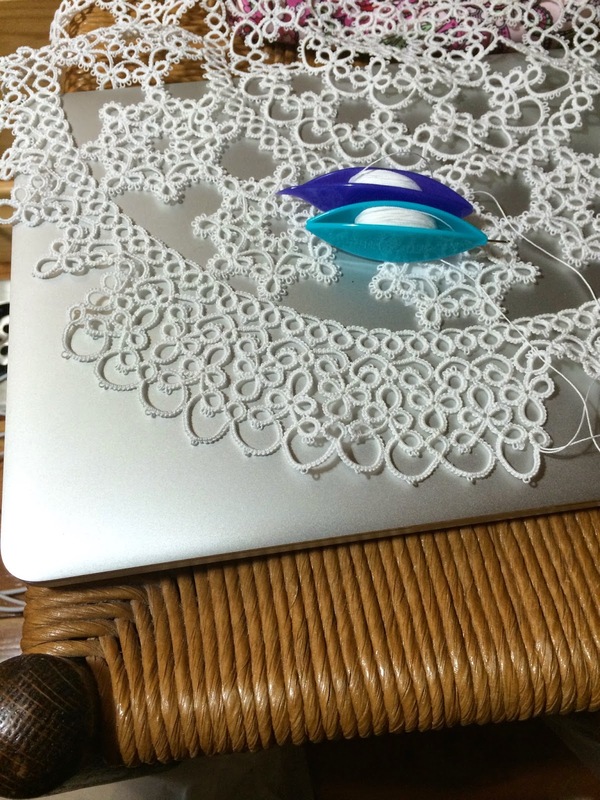 I can't believe I took on two doily projects at the same time. I'm enjoying myself, but I'm not making very fast progress on either one since I'm splitting my time between the two. 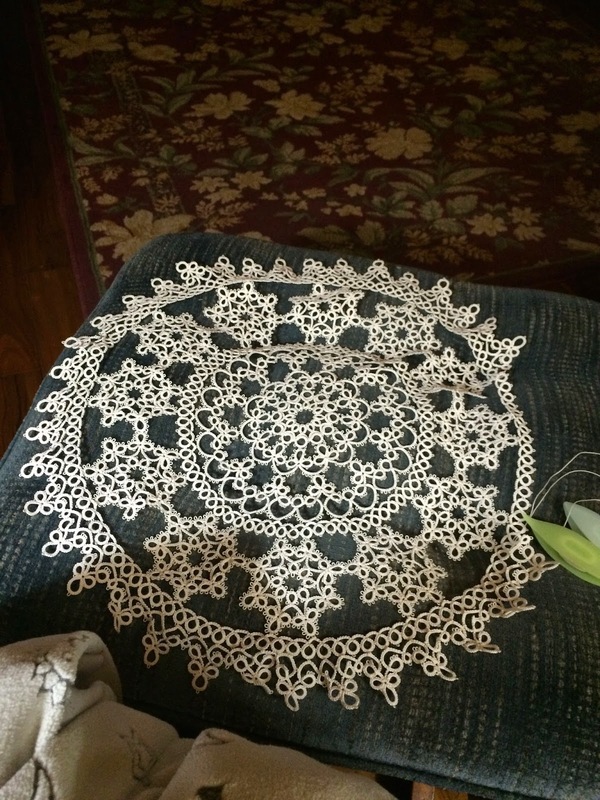 I think I counted 33 pattern repeats on the Masterpiece Doily, leaving 7 to be tatted. The end is in sight... again! 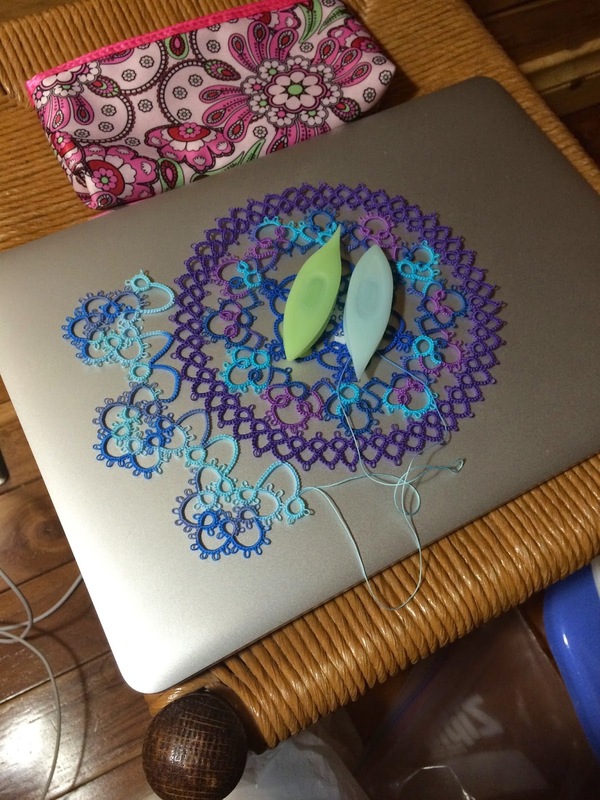 I also finished another pattern repeat on Renulek's tat-along. 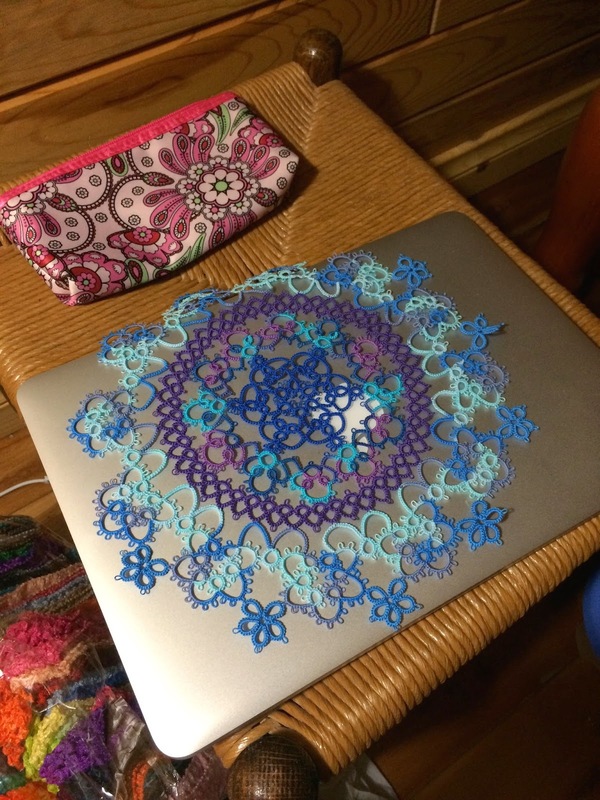 I'm really enjoying this pattern! It was so cold today! I'm glad that I was able to get together with the Tollway Tatters. It helped me get my mind off the frigid temperature. True to form, I forgot to take pictures of the group. 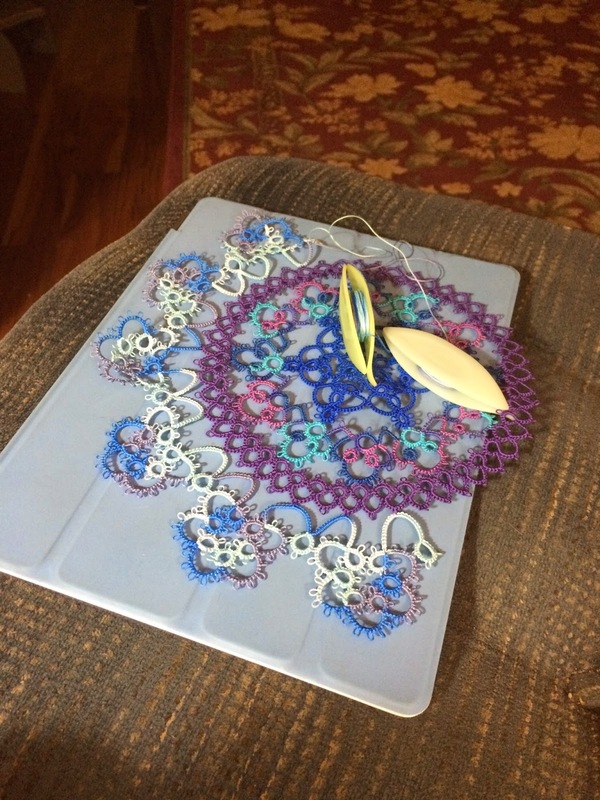 I guess I was having too much fun tatting and chatting! Sue Anna brought along a fun project for us to try... making Froggers! These are the two I made. 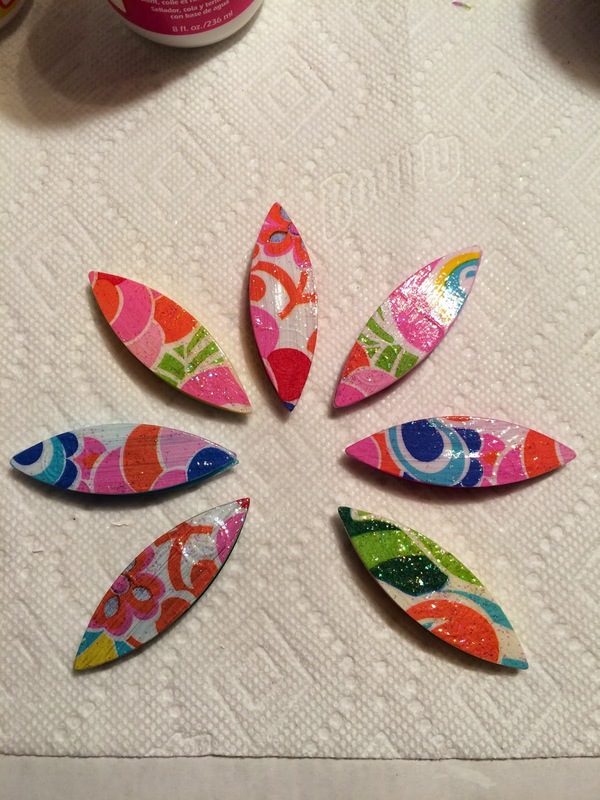 I think I might try to make some more before our next get-together. 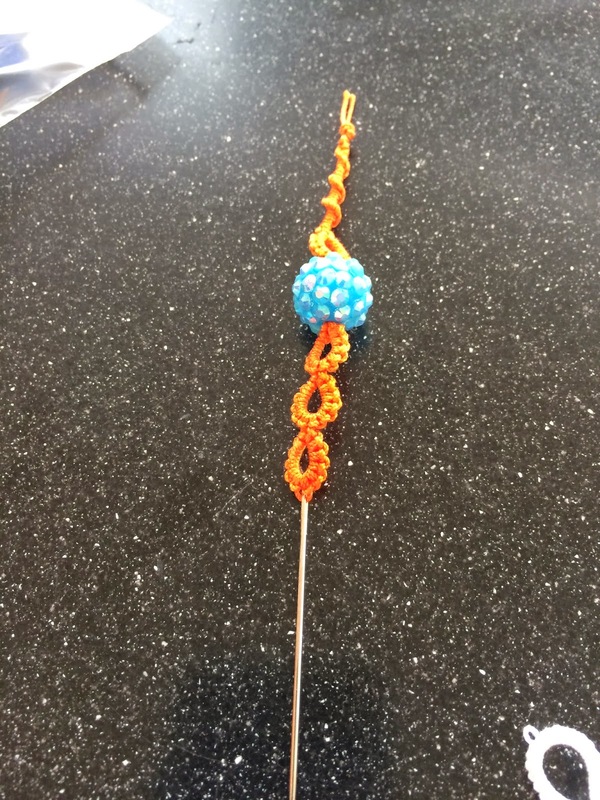 Carol came up with this design with split rings on either side of the bead... very cool! 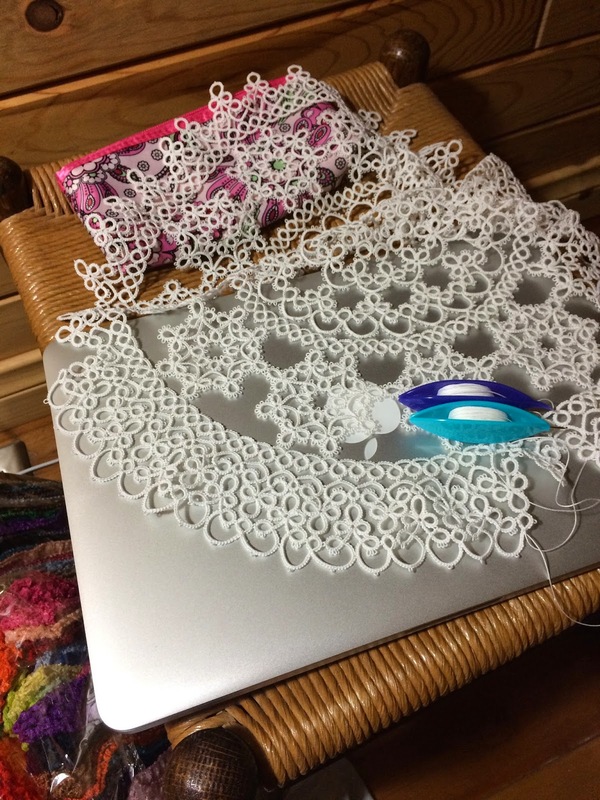 I managed two more pattern repeats on the Jan Stawasz Masterpiece, and then one more when I arrived home. 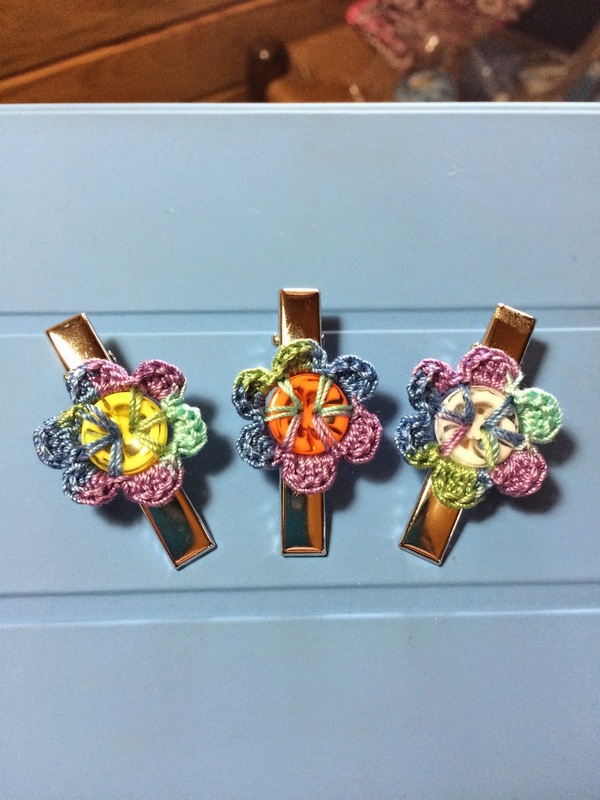 Three is good! 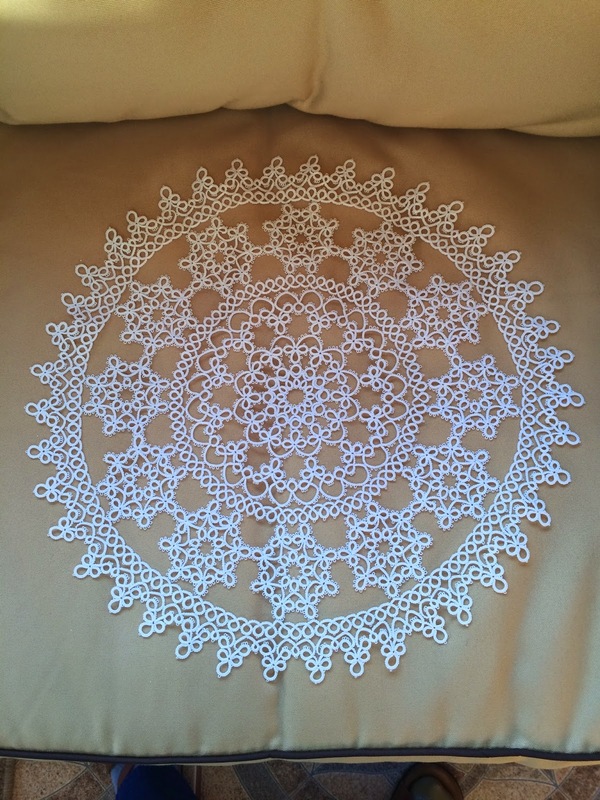 I also tatted one more pattern repeat on Renulek's doily. All in all, it was a fabulous day with good friends... despite the bitter cold! Time to reload the shuttles!